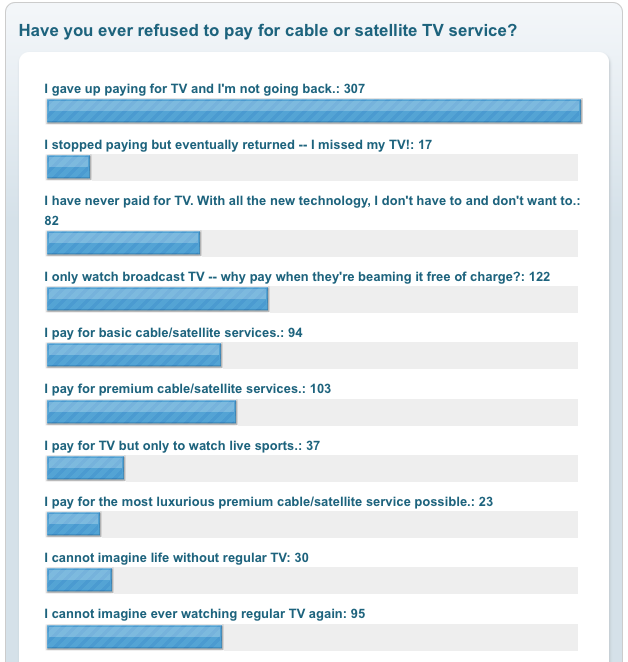 We recently polled Business Insider readers on their attitudes to paying for cable and satellite TV, and we asked for your comments on the future of television itself. The survey was prompted by the news that a generation of “cord-nevers” and “cord-cutters” is forming — young people who don’t want to pay for cable TV because their laptops and mobile devices provide plenty of free video. One third of you (307) said you had already given up pay TV and were not going back. Only 94 voters said they paid for basic cable. Another 103 owned up to buying premium TV service. Those low numbers were equalled by the 95 voters who said they could not ever imagine watching regular TV again. (The live poll is still open, incidentally.) Obviously, the poll is biased: It’s a self-selecting audience of people who are already getting their news from the web. Having said that, it indicates that “cord-nevers” may not be the TV industry’s main problem. 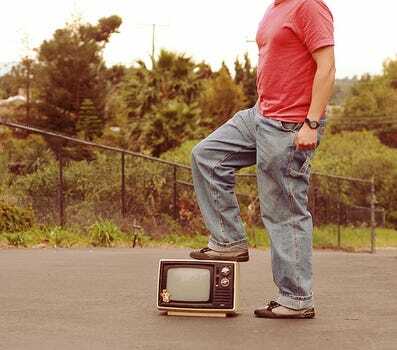 Rather, judging by the comment boards underneath both the poll and the original story about the death of TV, it is the “cord-haters”: People who actively despise traditional television with its clutter of irrelevant advertising and brainless programming. They are overjoyed that the web now offers an alternative way to watch shows and movies at a fraction of the cost. The Credit Suisse report identified new technology as the culprit that is now eating TV’s business. But as far as B.I. readers are concerned, it’s not just about the ease of watching movies on an iPad. Rather, it’s that they find TV to be of such low quality that they just don’t want to watch any more of it. Only now has new technology allowed them to watch shows and movies without all of TV’s baggage, such as paying for 500 channels when you really only watch about 10. Steven: The thing I hate about TV is you only watch a couple stations 99% of the time, but you pay for 150+ stations. dargoola: This year I cut most of the digital premium channels with on demand add-ons because I never have time to watch them. There’s a core Of TV channels I watch but it’s shrinking. I’m getting more of my news from the Internet, i blog a lot, and spend more time socially on the net. But TV is still it for the pure pleasure of vegging out and being entertained. realchuck: I’ve stopped paying some 5 years ago. I installed a ‘seedbox’ with a friendly 3rd-world country hosting provider and just leech torrents (automatically). It costs me some $50 per month including unlimited traffic. So I get TV-shows on the next day, auto-downloaded, and any blu-ray movie – also on the next day. I don’t have to respect any delays imposed by the assholes in the industry. flubber: TV will fail because of the parent companies and advertisers. How many infomercials do we need? How many times do they need to cut to commercial during a football game? Quite frankly I do not watch a lot of TV anymore because the amount of real content being aired is a joke and the amount of commercials is just downright insulting. I download everything or watch it on the net. Dean Wormer: The traditional TV folks are stuck. But they think this is about Netflix, Hulu etc. It’s not. Their product stinks. It’s been this way for years and its getting worse. Hulu is just methadone to get you off the crack pipe. Krissy: Let us be real here, most regular network TV on now is pure unadulterated shite. iWonder: Cable isn’t what it used to be. I had cable primarily for channels like Discovery, Science and History but now it seems those networks are being overrun by the same trash programming that took over the big networks a decade ago. Cable isn’t worth it now, 150+ channels and nothing worth watching, that’s why I’m done with it. jasno: I abandoned broadcast TV because of the incessant commercials. Even on the discovery channel it’s too much. Worse, the commercials are pretty much never for anything that I might possibly buy. For example, I am never going to buy a Chevy Silverado pickup, or any truck, but I have been subjected to about 97,391 commercials for pickup trucks. rusty syringe: Gave it up for awhile but came back this year. Direct TV’s free Sunday Ticket offer was to good to pass up. As with most guys I know, if it weren’t for ESPN, NFL, and NBA I wouldn’t get cable. Sports is all I watch on TV. Frank Castle: I’ve tried all the streaming services and the image quality is crap. With Comcast I have a crystal clear 1080 signal with Dolby digital sound. I have no desire to gather everyone around the laptop to view a show. All these services also are geared to the solo viewer. What do you do when Mom wants to watch HGTV, I’m watching a game, the kids have on disney channel. Your telling me running all those sevices seperately is going to be cheaper then another cable connection?